Hi all I'm Tennye and I will be your host for this week. I am looking forward to sharing a little bit of my life with you all. First off lets get to know each other, I am Tennye GiOtis and I hale from Austin Texas. Well, technically I am from Cedar Park, Texas. We are a small town on the outskirts of Austin. I lived here thru high school and most of junior high. Then moved into Austin to live with my grandparents while going to college. It was just easier to be closer to everything and they were great room mates to have. My husband and I moved back to Cedar Park about 20 1/2 years ago. I home schooled our 3 girls from K thru 12. We are a yours mine and ours family, my oldest daughter was adopted at birth, and has only been a part of the family since 2005 when she found us. Hubbies son lived with us off and on over the years, and is my heart son. After our girls finished school, I went back to work for 6 or 7 years. I had a couple of jobs, but my last one was selling Bernina's at an in store kiosk at Hancock's fabric. I loved that job, and hated losing it, but sales is just not my forte. I taught classed during the few years I was with Bernina, and I loved teaching sand passing on my love of quilting, and sewing. I have continues to teach sewing to children since then. My love of quilting comes from the quilts I had use of in our home while I was growing up. I shared a picture of my favorite one on Instagram this morning. Some day I want to duplicate that one. As I say in my bio I started quilting as a way of giving a much nicer gift than I could afford to give. I made 2 or 3 quilts before I ever had any training at all. Then I found a community class on basic quilting, and signed up. It was a 6 week class and I loved every minute of it. 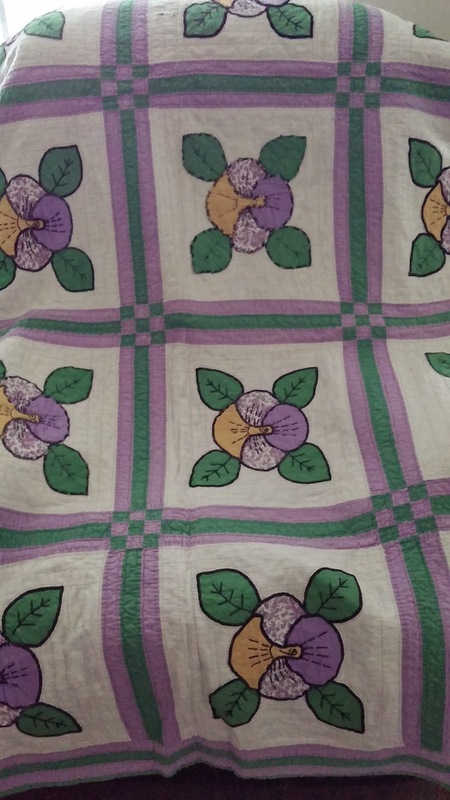 During that class my grandmother realized she had never taught me what she knew of quilting. So after each class I went to her house and we talked about what I did in class and she expounded on it. What a blessing to have her share her knowledge and tell me her quilting stories. She was one of the quilters of the quilt photo I shared. I will not be posting much on my personal accounts this week, but if you like what you see this week you can find me at Tennye on Twitter, Tennye on Instagram, and Tennye Wiley GiOtis on Face book. As well as Little Star quilts on blog spot. So until next time yall have a very quilty week.